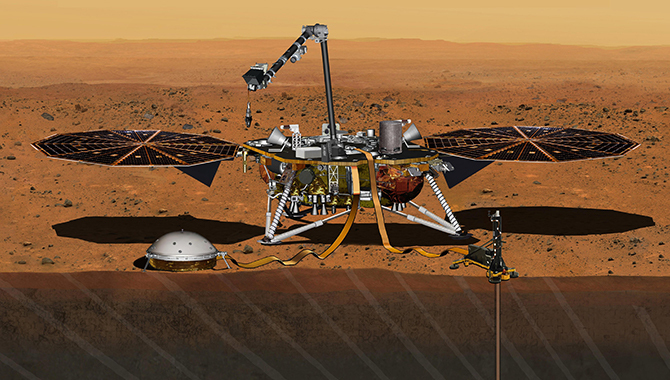 This artist’s concept of the InSight lander shows the solar panels and scientific instruments deployed. NASA’s exploration of Mars is set to expand in a new direction later this month, when the InSight lander arrives at the Red Planet. The InSight mission will be unlike any in NASA’s history at Mars, with a stationary lander using scientific instruments to explore beneath the planet’s rocky, dusty surface. 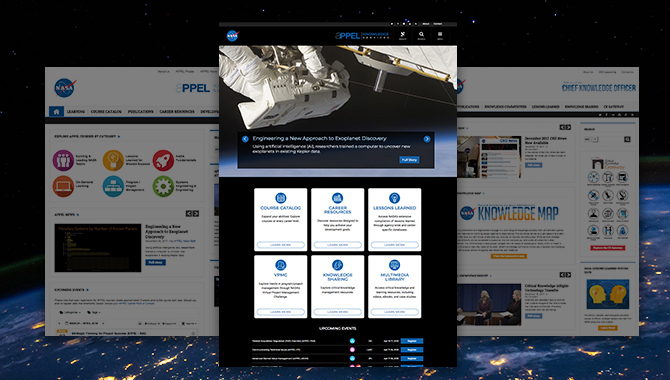 “I’ve been dreaming about this mission, this science, for … almost 40 years, and actively scheming towards it for at least 25,” said William “Bruce” Banerdt, InSight’s Principal Investigator and Principal Research Scientist. “We know a lot about the surface of Mars, we know a lot about its atmosphere, and even about its ionosphere. But we don’t know very much about what goes on a mile below the surface, much less 2,000 miles below the surface, down to the center,” Banerdt said, speaking at a NASA media briefing on the mission. This will be the first mission that’s going to Mars specifically to investigate the interior of the planet. Scientists are interested in the interior of Mars because it likely holds important clues as to how all rocky planets formed and evolved. Unlike the Earth, however, which has high internal heat and is very geologically active, Mars has been cooler and much more stable in the billions of years since its formation, preserving much of the historical geological record. 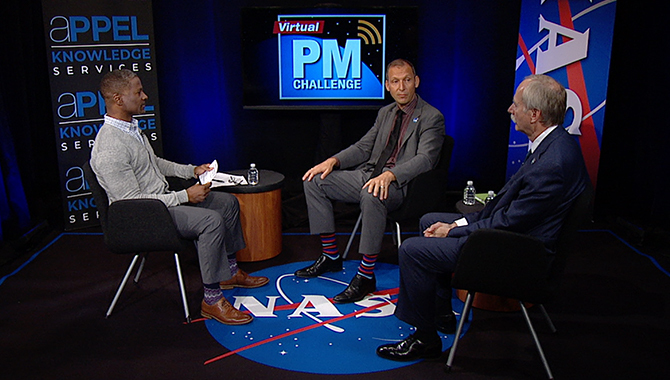 “Mars is kind of in the sweet spot,” said Banerdt. NASA launched InSight on May 5, aboard an Atlas V rocket from Vandenberg Air Force Base in California. It is the first interplanetary launch from the West Coast. InSight is nearing Mars, protected within a cruise stage capsule, powered by solar arrays. The cruise stage has small thrusters and sensors to control the capsule’s orientation in relationship to the Sun. On November 26, the lander will jettison the cruise stage and streak into the atmosphere of Mars at a 12-degree angle, traveling about 12,300 mph. This begins a dramatic descent through the thin Martian atmosphere, in which InSight will be subjected to a staggering 12-g force of deceleration. The descent will take approximately six and a half minutes, with the lander’s heat shield exposed to temperatures well above 1,000 degrees C.
Approximately 10 miles above the surface of Mars, while InSight is still traveling at about 850 mph, a supersonic parachute will deploy. Seconds later, InSight will jettison the heat shield. 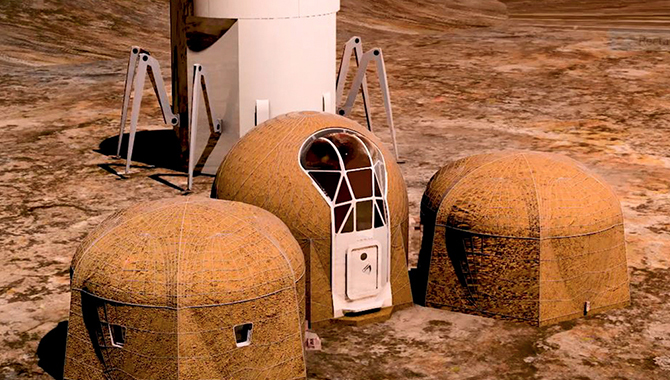 The lander is about 5 ft in diameter with a deck height that will range between 33 and 43 inches. The lander will generate electrical power via two large solar panels that will deploy upon landing, creating a wing span of nearly 20 ft. The team chose Elysium Planitia, which loosely translates as “flat paradise,” for the landing site. The InSight team is expecting to find a large, flat area devoid of the large rocks that rovers have encountered elsewhere on the planet. This is essential because InSight will be stationary and will deploy its scientific payload to the surface of Mars via a 5 ft, 9 in. robotic arm. Large rocks at the site could be a significant obstacle. “Scientific success depends on landing the craft in a relatively flat area, a veritable parking lot where rocks are few in number. 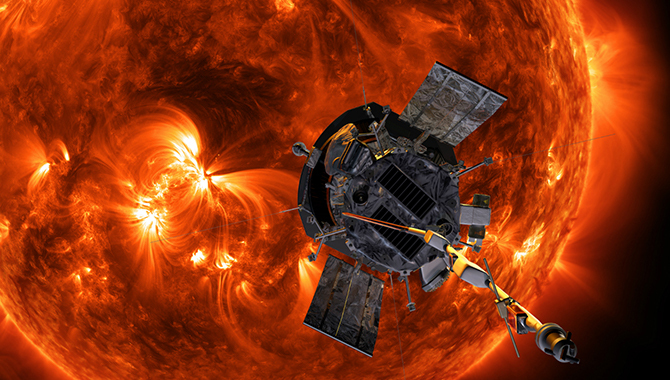 It also requires … that we must be close to the equator to ensure the lander’s solar arrays can provide power throughout the year,” Hoffman said. The scientific payload includes a package of six seismometers, a heat probe, and a radio science experiment. Using a spring-loaded hammer, the team plans to drive a heat probe down as far as 16 ft below the surface. A tether with 10 temperature sensors will determine how fast the temperature increases with depth. The probe will also send out heat bursts and measure how quickly they dissipate, which will determine if the soil has insulating or conducting properties. InSight will arrive at Mars being trailed by two briefcase-sized CubeSats that the team will test in bolstering communications as InSight enters the Martian atmosphere, at a time and place where other NASA communication assets at Mars are unavailable. This will be the first test of CubeSats at another planet.